Equal parts classic and modern, this full-length, A-line gown balances a contemporary embroidered lace and chantilly lace bodice and a sleek, chic mikado skirt. 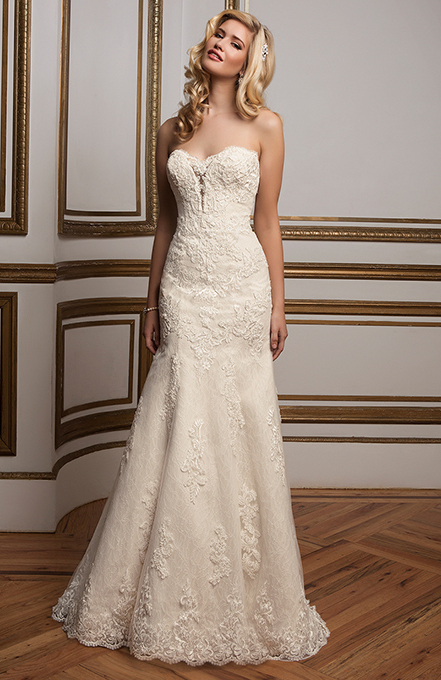 A deep V-neckline is gorgeously trimmed with lace to match the lace bands cinching the waist. The low, open back is perfectly framed with lace straps, while covered buttons trailing down the length of the skirt and train provide the sweet, eye-catching finishing detail.